Echoing 2017 UK figures that showed new car CO2 rose for the first time in 20 years, the data from Jato Dynamics shows increasing SUV registrations were a key factor along with the decline of diesel vehicles. Data for 2017 shows that diesel cars registered in the market had a CO2 emissions average of 117.9g/km, compared to petrol cars, which had an average of 123.4g/km – a difference of 5.5g/km. The volume of diesel cars registered in Europe in 2017 fell 7.9% to 6.77 million units, giving diesel cars a 43.8% share of total registrations – 11.1 percentage points lower than their peak in 2011, and the fuel type’s lowest market share since 2003. Diesel demand fell by double-digits in Germany and the UK, and in France and Spain it fell by 5.4% and 8.1% respectively. As a result, average CO2 emissions increased in all of these car markets. In contrast, registrations of petrol cars increased by 10.9% – the highest level since 2003. This meant the market share of petrol vehicles grew by 3 percentage points from 47% to 50% between 2016 and 2017. Meanwhile alternatively fuelled vehicles only experienced a small increase in volume. And despite the declining popularity of diesels, they increased their market share from 3% in 2016 to 5% in 2017. Battery Electric Vehicles (BEVs) only saw small growth too. In comparison, the market share of hybrid vehicles increased by one percentage point. The organisation has now warned that EU CO2 targets of 95g/km could be difficult to achieve if demand for diesel continues to fall and electric vehicles fail to plug the gap. 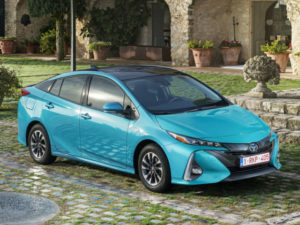 It added that hybrid vehicles could therefore be the best alternative to diesel vehicles in the short term, reducing average CO2 emissions whilst also meeting consumer demand – helping the industry to reach CO2 targets of 95g/km by 2021. Jato research also found that Toyota was Europe’s cleanest car manufacturer for 2017 amongst the top 20 best-selling brands, with its emissions average decreasing by 2.7g/km to 101.2g/km. This can be attributed to increased demand for its hybrid vehicle models – and the brand has now said it will phase out all diesels by 2019. Peugeot, which led the ranking in 2016, fell to second place after its emissions average increased by 2.7g/km to 104.5g/km in 2017. This was mainly due to its increased presence in the SUV segment, in particular with the 3008, which experienced a high volume of registrations.